Motorsport back in the day seemed like it must have been one hell of a time. In an era when it was rare to, y’know, actually take your cars out to test them before you brought them to the track, so every so often, a team would show up at the track only to find, lo and behold—their seemingly revolutionary car was a hot mess. Such was the situation with the 1968 Marcos Mantis XP. The Mantis already looked out of place for its era. The late 60s saw an influx of curve. Manufacturers like Ford and Porsche were keen to create smooth, flowing lines you just wanted to run your hands across. But the Mantis? It was sharp and angular, looking more like something you’d expect from a designer trying to be futuristic in the 1980s. The car was styled by Dennis and Peter Adams with the help of Stan Gray, a one-off specifically designed for twenty-four hour races. Specifically, y’know, Le Mans. The body was fiberglass over a Marcos-traditional stressed plywood tub, all supported by steel-tube subframes. 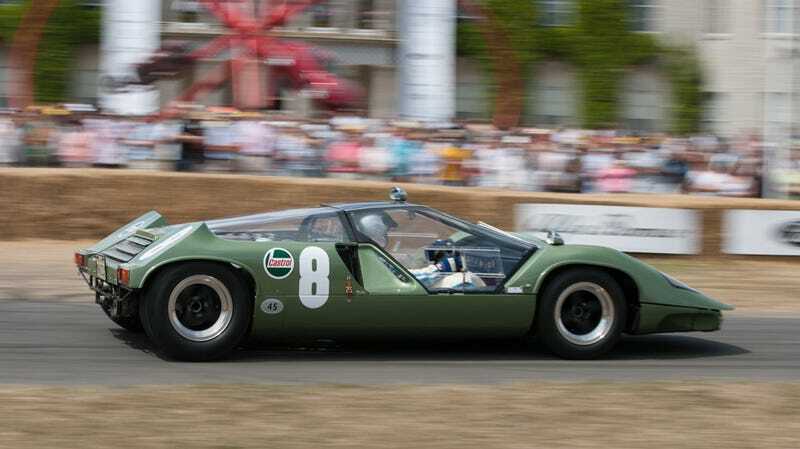 Initially, the plan was to use a BRM V12 engine, but lacking the funds to make it happen, the Marcos was endowed with a 3-liter Brabham-Repco 740 V8. And since they were already at it, they rang up John Cooper and asked for 1967's all-independent suspension setup. Next thing you know, they were on their way to a whole entire functioning car. That year, Le Mans was the victim of some civil unrest, so its traditional May slot was pushed back to mid-September. They literally cut a hole in their workshop to lower this bad boy out to get ready for the twenty-four hour extravaganza—and it got moved. Well, no big deal. The folks at Marcos were confident they had a winner. Their ultra-lightweight car promised to drive as well as it looked, all cat-eyes and wedge shapes. So, they figured they’d break it in at the 1000 Kilometers of Spa. It was actually a very big deal. A very big, bad, unfortunate deal. It rained so goddamn hard that the cockpit of the car started flooding thanks to all the pesky holes it had in the bodywork. It lasted a whole unlucky thirteen laps before they had to bring it in and call it quits. It seemed… well… pretty hopeless. Trying to fix the car would be just as difficult as building the damn thing in the first place, so the folks at Marcos shrugged their shoulders and said, nah, we don’t need to run three cars at Le Mans. Out came the racing motor and in went a Buick V8, allowing the car could be registered to run on UK roads. Perfect! Aha—not so much. British tax collectors wanted so much money for the purchase tax on the car that they just shipped the Mantis off to the United States and toured it around auto shows. Eventually, at the 1970 LA Auto Show, Tom Morris bought the XP under the very strict condition that it should remain road-legal. As far as we know, the Marcos Mantis still in his possession and, yes, is still road-legal. One unfortunate race car—but damn, that’s gotta make one hell of a collector’s item.